Feet are the most important tools for living. They serve as a base for your body to stand upon, a model for your hottest shoes, and now as an unbeatable Toothbrush or pen Holder. These toes have a suction cup on the backside for tight grip onto non-porous surfaces like the bathroom mirror or glass window. The Toothbrushes slide right between the toes and are held nicely in place. 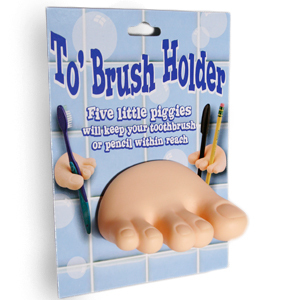 They can even hold a pack of dental floss or serve as a hang hook for a loofah. Whatever you're into, these toes are gonna tickle your fancy.